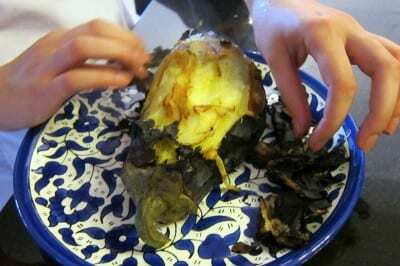 This is the practical part two post! There are many buses that ply the dusty, choked roads between Mui Ne and HCMC, but I’d recommend taking Futa Buslines’ Phuong Trang (link to Vietnamese-only site) bright orange buses, one of the more reliable bus operators. Yes, it will take you a bit longer than the 5-6 hours for the open bus tours, but it’s safe and they stop for food half way in. For your 130,000 dong ticket ($6.25) you’ll receive a bottle of water, a fresh towel and no smiles. The bus trip takes 7 hours and will stop once for a bathroom and fruit break, and once for lunch. Tickets can be booked at the office on De Tham near Pham Ngu Lao (272 De Tham; link is to Google map. Phone is +84 838 309 309), and in Mui Ne there is a separate office at the end of the beach strip (the directions away from the big resorts. Phone for Mui Ne is +84 623 743 113). Buses leave HCMC at 7am, 7:30am, 8am, 1:30pm, 2:30pm, 3pm, 6pm and 7pm. Buses leave Mui Ne at 1am, 7:30am, 8:30am, 9:30am, 11:00am, 2:30pm, 3pm and 3:30pm. In both cases, the bus will ask where you are staying and drop you off right at your door, a nice add-on that I was not expecting. Over the years, I’ve travelled many, many times between Saigon and Phan Thiet/Mui Ne: by bus, bicycle, car, minivan, coach, but most of the time, by motorbike. I love the ride along the Ocean Road from Vietnam’s biggest city to one of its most popular beach retreats. But there is another way: put your motorbike on the train and let the rails carry your wheels. It’s cheap, easy, fun, fast, efficient and relaxing. Even if you’re not taking your motorbike with you, the train is a much better option than taking one of the buses along Highway 1. While the Saigon-Phan Thiet train is an express service, some trains make short stops at Bien Hoa and Binh Thuan. 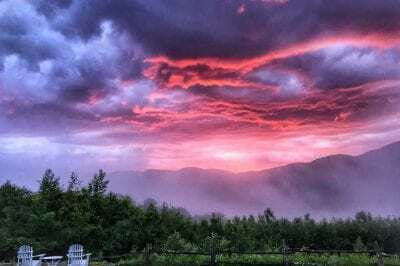 His post is here, and includes costs, different booking options, and how to take the train if you’re also bringing your motorcycle along for the ride. For times and schedule, and online purchase of tickets, see Vietnam Railways here. The train departed at 6.40am and arrives at Thiet Phat at 11.10am, the journey was very comfortable, we were given bottled water, towel and there is a food cart that comes along the aisles. The ride was so relaxing we both immediately dozed off for a nap for a couple of hours as the train gently rocked along the tracks. TV is on board, good toilet facilities and the cost is approx 140,000 VND each way. We took a taxi from Thiet Phat for 80,000VND only 10 to 15 minutes away. The Ocean Road is the scenic route between Saigon and Mui Ne. Skirting the deserted coastline for much of its length, occasionally ducking inland through cashew trees and dragon fruit plantations, over white salt flats and green rice fields, past hot springs, hilltop pagodas, and dusty villages where ox-drawn carts full of sun-dried hay linger in the heat, the Ocean Road is a destination in itself. It may be longer than the direct route on Highway 1, but the Ocean Road is a far more rewarding, scenic, and relaxing way to travel between Saigon and Mui Ne. See his post for more! Mui Ne’s many fishing boats. Rent a motorbike and explore Mui Ne proper and the fishing catches that come in and out of the sea. At dawn until about 10am there is also a morning market in Mui Ne village. Take the bike out to the sand dunes, a dozen kilometers out of town. Hike and visit the nearby Fairy Spring. 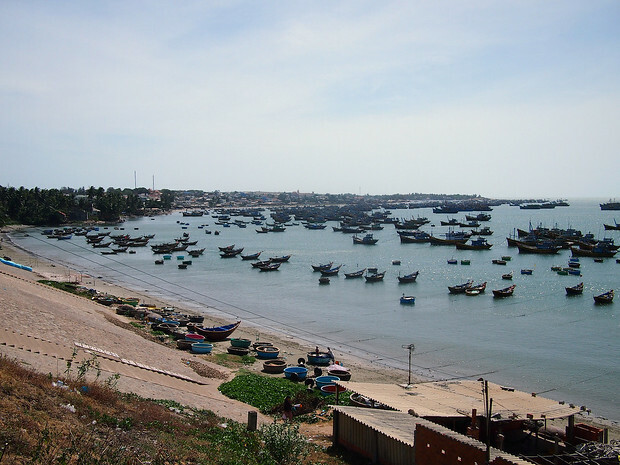 Visit Phan Thiet harbour and its many larger fishing vessels, with fresh catch of the day for sale on the bridge linking Phan Thiet and Ham Tien, and fish pho at the nearby market. You can also find fresh fish on the bridge near Mui Ne’s smaller harbour. Hike up Takou Mountain and its nature reserve (about an hour away). Enjoy the view from your room and wander along the water’s edge at dusk. 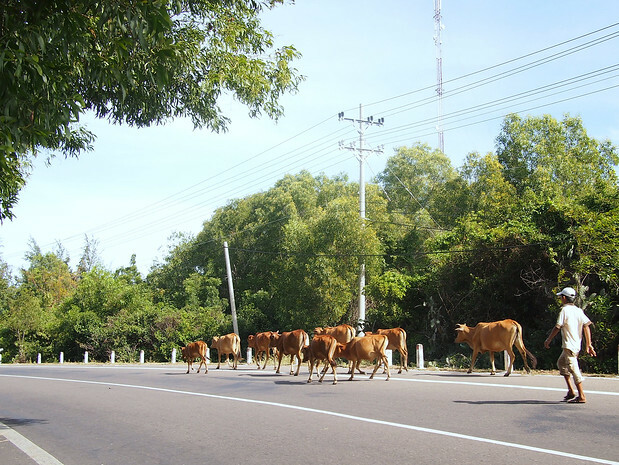 Cow crossings abound just outside the resorts. Practicing kitesurfing without the surfing part. I stayed at the beautiful Bien Dua Resort (136 Nguyễn Đình Chiểu St) filled with plants and hammocks, but I would caution those who plan to head there. Like many other guesthouses in Vietnam, you either pay upfront if you like the place, or you make sure you have a Plan B since I was kicked out a few days into my stay when she said new customers had reserved and were coming in. What really happened, I suspect, was that the newer customers did not negotiate down the rates as I did, and thus she could make more money off the room with me not occupying it. Despite the fact that she said the room was available, she changed her mind. Either way, despite the beautiful environment and upkeep of the rooms I wasn’t terribly impressed, but given the Trip Advisor reviews (at the link above) I got off easy. From there I moved to Thanh Duy (243 Nguyễn Đình Chiểu street, +84 123 452 685), which was run by a lovely family and the grandmother made what remains one of the best hot Vietnamese coffees I’ve had yet in the country. The rooms were clean and staff very sweet, though it was not overlooking the beach like Bien Dua. I, uh, may or may not have snuck into the resort across the way and used their pool instead. For those looking for dorms or a hostel environment, the very clean Mui Ne Backpackers came highly recommended from a reader I met up with during my time in Mui Ne. For lunches, Lâm Tòng (92 Nguyễn Đinh Chiêu street +84 62-3847598) is right on the beach, with a dizzying amount of tables set out facing the water. A small balcony area juts out into the beach itself, great for low tide but ill-advised when the water is higher; you will get wet. Some good noodle dishes and fresh fruit options, as well as grilled fish with lemon and the typical Vietnamese staples. Not the best daytime soups – for those, head into Mui Ne itself at 8am or around 4pm for fish pho and other great market eats, or eat the bun bo noodle soup I described in my prior post. However, a solid bet for midday snacking with a view, even if it’s not the best food you’ll eat in Vietnam. 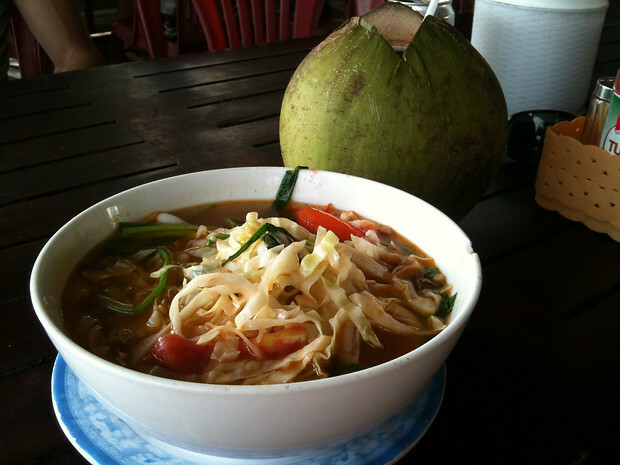 An unusual Christmas lunch of seafood soup and fresh coconut from Lâm Tòng. If you’re sick of Vietnamese food or beach eats: Sindbad Kebab (233 Nguyễn Đình Chiểu Street) offers something vaguely resembling Mediterranean plates, with kebabs, hummous salads, tsatziki, sweet potato fries and other small dishes. Open late. For dinner, Taxi Stand Soup (what else can I call it? ), the soup I wrote a love affair about in my last post, is my first choice. It’s in the empty lot just before Tutti Frutti restaurant. If you can’t see her, it might be because she’s hidden by all the parked taxis, their drivers slurping up her braised pork soup. No menu – just soup. 25,000 dong – 30,000 dong depending on what you order, with a fresh coconut to accompany it if you’d like (an extra 10,000 dong). Note: reader the Traveling German found the soup and has a bit more details on how to find it here. Another option is the seafood place I photographed below, Chi Em (195 Nguyễn Đình Chiểu Street; +84 166 808 4171). Lovely and family owned, it was less touristy than some of the other seafood joints along the beach. Opt for the tamarind crab, the scallops (fried in pork fat and shallots and served with peanuts) or a smaller fish stuffed with chili, lemongrass, ginger and herbs. 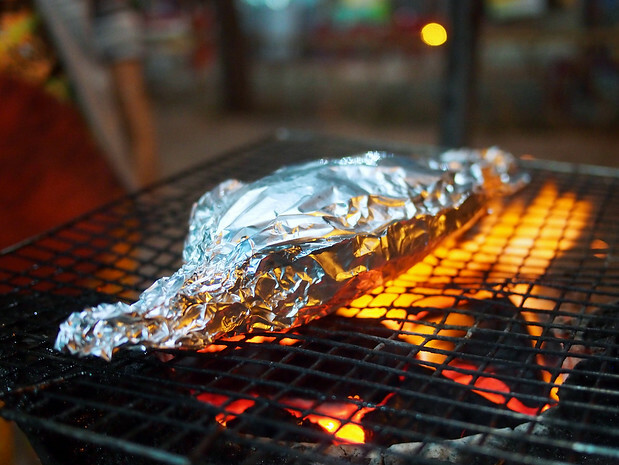 Grilled fish stuffed with chili, herbs and lime. 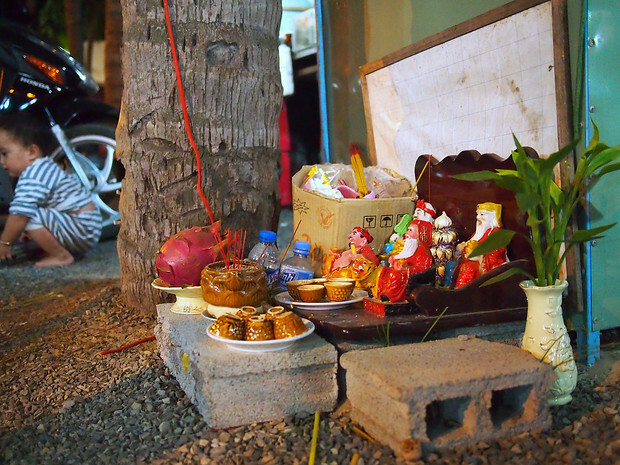 No abode (outdoor or otherwise) is complete without a small altar of offerings. We ended up buying small bottles of Vodka Hanoi (cheap, $1.25 Vietnamese vodka that is distilled from rice.) and mixing drinks on the water’s edge and chatting. These can be procured from any corner store on the beach and in HCMC. Strangely bereft of them in their namesake of Hanoi, and Hanoi friends hadn’t even heard of the stuff. For celiacs: the blue label is distilled from rice, the red label from corn and grains. For actual bars, ended up at Fun Key Bar (124 Nguyễn Đình Chiểu Street) a few times after dinner. Very reasonably-priced drinks, right at the edge of the water and very nice owners and staff. Open for lunch too, and my wheat-eating friends say their crepes are a good bet. Open quite late. That’s about it for now! I only spent 6 days in Mui Ne, but it was a fun place to explore, great to be near the beach (though it’s not a lounging beach – be warned! It’s very, very windy) and a fun last-minute decision for a Christmas vacation. Travelfish’s guide to Mui Ne here. Pinay Backbacker’s long Mui Ne guide here. 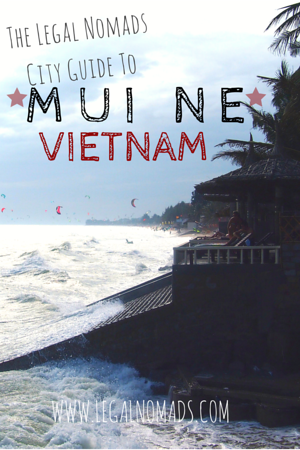 La Vie au Vietnam’s Mui Ne guide for what to do (French). For those of you heading to Saigon and looking for a guide, I’ve written a far more comprehensive Saigon Guide (clocking in at over 10,000 words!) with where to eat street food, international food, drinks, and also a basics sections for visas, hospitals, taxis and more. if you are going to visit the mekong delta, the floating market in can tho is worth a visit. 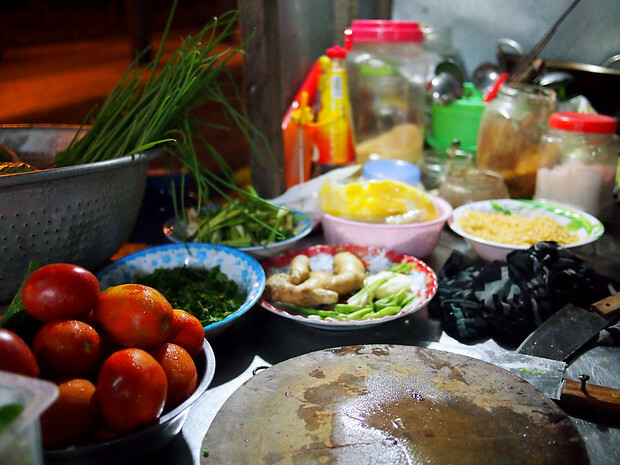 also downtown can tho is full of wonderful street foods and hidden island to explore. 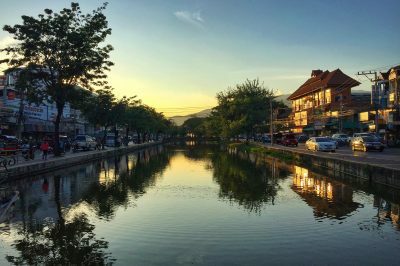 Hi Jodi: If you’re forced to choose between Hoi An and Hue, I’d suggest Hoi An – it’s spectacular. 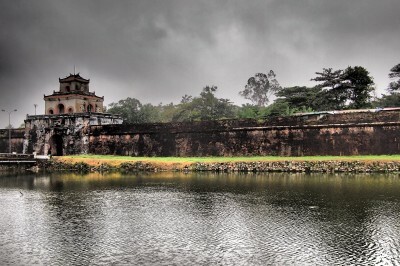 Although the Purple Palace and ruins around Hue are quite magnificent as well. Hugs! Thanks for putting together this immensely helpful post! We’ll be heading to Vietnam mid-March and would really like to spend a few days exploring Mui Ne… now most of our research is done! Great and useful tips. Thanks! Thanks for linking to me in this post, Jodi! 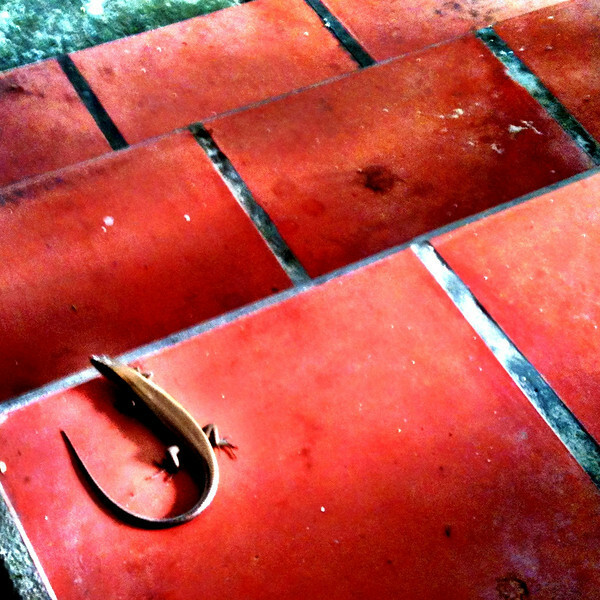 You reminded me of a favorite old post and a favorite old beachside town :) So glad you made it to Mui Ne! I’ll be going to Vietnam at the end of the summer, I’ll definitely be checking out Mui Ne. Glad you enjoyed Mui Ne. Very accurate description of the service in Vietnam (gives me a chuckle). I enjoyed my time in Hoi An. Lots to explore. Any of the restaurant cooks will show you around the market or let you into their kitchens for a small fee (although I’m sure you can sweet talk them into it as well.) Also, I’m all for sneaking into resort pools. more and more reasons to visit vietnam!! Departed at 1 am 3 days later on the sleeper to Na Trang, flew to Hoi An, spent 6 days there and loved it. Thanks for reminding us. Still waiting for Sheryl to wear her new outfit we made there 11 months ago. Haha, no I am not following. I’m actually staying mostly in Saigon and not going up to Hoi An or Nha Trang. Loved my time here thus far. Hope you and Sheryl are well and hope to see you guys this summer when I’m back in the 514! We love Mui Ne also! The food, the dunes, the beach…although the waves were massive when we were there and I almost drowned, but besides that, it’s gorgeous! Thanks for the post and tips. Mui Ne is such a great little place. It has some beautiful scenery-the sand dunes in particular are lovely! I endeed up there over American Thanksgiving and have to say, the food was amazing, and very different to what I was normally used to for Thanksgiving! i would highly recommend you hit up hoi an. it’s got some nice beaches and a lovely old town. and best of all, if you need some new threads the tailors there can make you anything in about 24 hours! I went to mui ne and saw that there are a bunch of dragon fruit farms. I never found them after trying very hard :(. Do you know about these? I think the sand dunes are pretty cool too. Hi, great post! :) Would you know how much it would cost to try kite surfing for a couple of hours? Thanks! Hello Jodi! I’m contemplating whether I should goto muine or vungtau from ho chin min. The only thing is muine is so far and I don’t know if its worth the trip. Could you let me know your thoughts? Thanks so much! 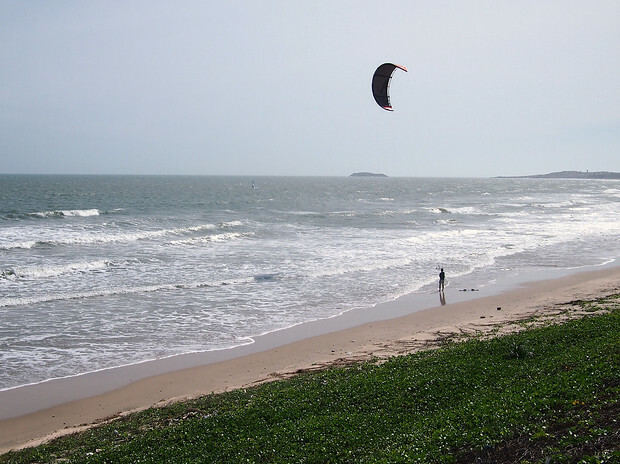 Vung Tau was fun for me because of the food (the banh khot) but for a sports-based beach, definitely Mui Ne. 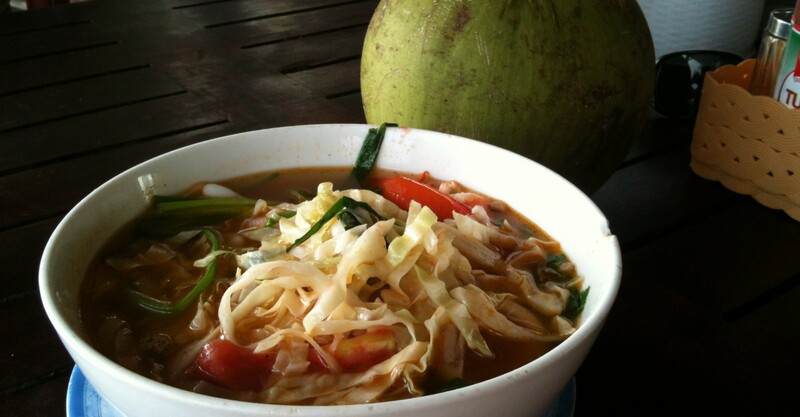 If you’d prefer just beach time without the choppy water, head south to Pho Quoc instead. Thanks for your quick response! I think I’ll visit vAngtau since it doesn’t seem too far to visit. 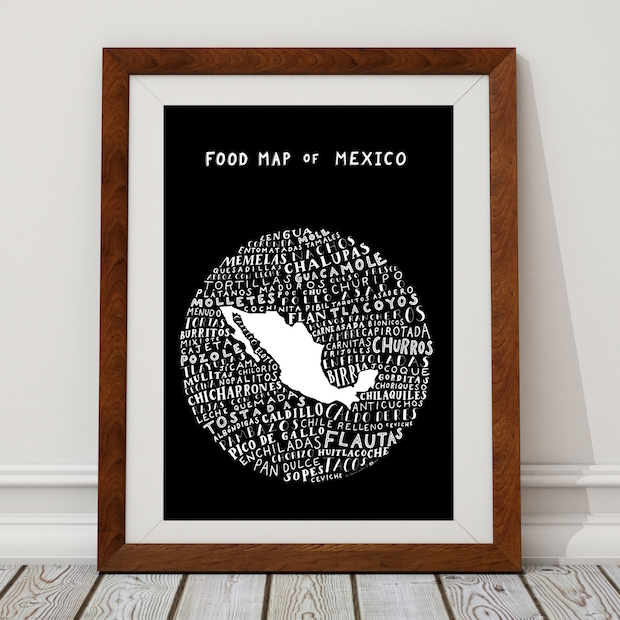 Are there markets in the area and perhaps restaurants you might recommend? I will be in Mui Ne in September, looking to stay for a while. Hows the job situation there? I’m an English teacher from the UK.. however I wouldn’nt mind doing anything! Hi Sarah, not sure about job market as I was just there on vacation from HCMC so you might want to check expat forums for info on that.